The Dawning is back for 2018 and it’s brought a brand new activity to Destiny 2, baking! 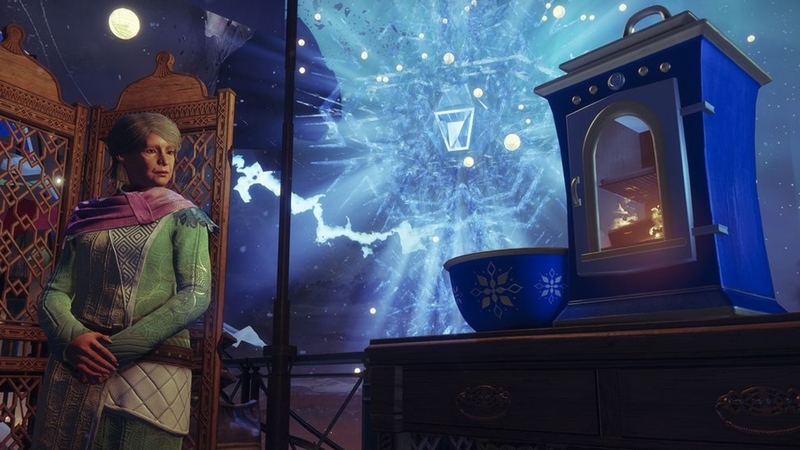 If you head to the Tower and speak to the vendor for The Dawning, Eva Levante, she’ll give you an oven and the ability to earn a new Exotic sparrow, should you be able to deliver enough bakes. What this oven allows you to do is combine different ingredients with Essence of Dawning, a new consumable you earn from completing activities in the game, in order to bake items that you can deliver to various vendors. Gjallardoodles – To make these you need to use Ether Cane as Ingredient 1, and Delicious Explosion as Ingredient 2. These can yield either a Rare or Legendary drop, and the person you’ll be delivering these to is Zavala. Traveler Donut Holes – To make these you need to use Cabal Oil as Ingredient 1, and Flash of Inspiration as Ingredient 2. These can yield both Rare and Legendary drops, and you’ll be delivering them to Ikora Rey. Chocolate Ship Cookies – To make these you need to use Cabal Oil as Ingredient 1, and Null Taste as Ingredient 2. These can yield a Rare or Legendary drop, and the person they’re for is Amanda Holliday. Telemetry Tapioca – To make these you’ll be using Vex Milk as Ingredient 1, and Bullet Spray as Ingredient 2. These can also yield a Rare or Legendary drop, and you’ll be delivering them to good old Banshee-44. Eliksni Birdseed – To make these you need to use Ether Cane as Ingredient 1, and Personal Touch as Ingredient 2. These will yield both Rare and Legendary drops, and the ‘person’ you’ll be delivering them to is Louis, Hawthorne’s Falcon. Gentleman’s Shortbread – To make these you need to use Ether Cane as Ingredient 1, and Perfect Taste as Ingredient 2. They can yield Rare and Legendary drops, and the person you’re delivering to is Devrim Kay. Alkane Dragee Cookies – These are made from Chitin Powder as Ingredient 1, and Bullet Spray as Ingredient 2. These will award Rare and Legendary drops, and the person you’re delivering to is Sloane. Infinite Forest Cake – Making these bad boys takes Vex Milk as Ingredient 1, and Impossible Heat as Ingredient 2. They will drop Rare or Legendary rewards, and you’re delivering them over to Failsafe of all people. Radiolarian Pudding – To make this strange sounding concoction you need to use Vex Milk as Ingredient 1, and Electric Flavor as Ingredient 2. These drop Rare and Legendary rewards, and you deliver them to Asher Mir. Vanilla Blades – These spicy sounding things are made from Cabal Oil as Ingredient 1, and Sharp Flavor as Ingredient 2. They drop Rare or Legendary rewards, and they get delivered over to Lord Shaxx. Javelin Mooncake – This is made from Chitin Powder as Ingredient 1, and Sharp Flavor as Ingredient 2. They drop both Rare and Legendary rewards, and they’re going to be delivered over to Ana Bray. Dark Chocolate Motes – These are made from Taken Butter as Ingredient 1, and Null Taste as Ingredient 2. They drop Rare and Legendary rewards, and they get delivered to the best vendor in the Tower, The Drifter. Candy Dead Ghosts – These odd sounding things are made from Dark Ether Cane as Ingredient 1, and Flash of Inspiration as Ingredient 2. They’ll drop a Rare or Legendary reward for you, and you’ll be taking them over to Spider. Ill-Fortune Cookies – Another evil sounding creation, made from Dark Ether Cane as Ingredient 1, and Impossible Heat as Ingredient 2. They drop Rare and Legendary rewards, and you take them over to Petra Venj, which explains the evil name. Strange Cookies – These, which you can already tell who the intended recipient is, are made from Taken Butter as Ingredient 1, and Electric Flavor as Ingredient 2. They drop Rare and Legendary rewards, and, as you guessed already, they’re being delivered to Xur. This is everything the community is aware of right now, and it’s important that you remember you’re combining Essence of Dawning with everything as Ingredient 3. If you’re hoping to get the Triumph for The Dawning too then you need to also make something with the wrong combination. Any will do, but it has to make Burnt Edge Transit. Let us know how you get on in the comments, and of course update our list if there’s anything we missed! Is Nameless Midnight The Best Scout Rifle For PVP?